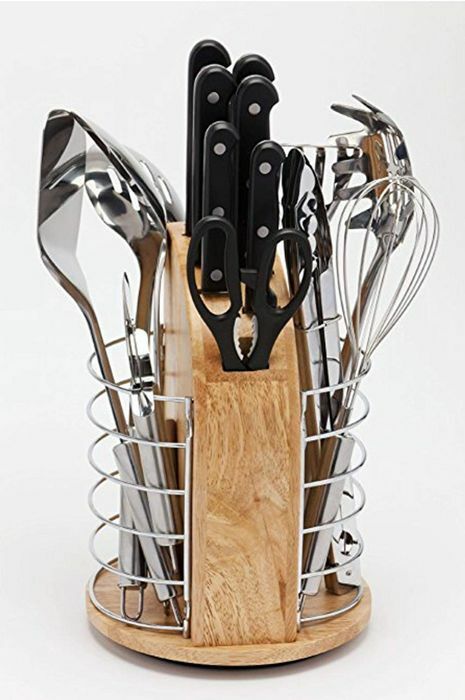 K- Pro Lazy Susan Utensil Set - Scissors, Sharpener, Chefs Knife, Carving Knife, Filleting Knife, Bread Knife, Utility Knife & Paring Knife. The Utensils included are: Pizza Cutter, Masher, Pasta Grabber, Salad Tongs, Whisk, Spatula, Solid Spoon & Straining Spoon. This product is not free please change description. How is it free, am i missing something ? I'd imagine the op didn't put in a price in both sections and it's not free but just a "good price" item.